I meant to post this a few weeks ago, but um… we’ve been busy riding our bikes…. On a total whim, I got Anne an Oma for Mother’s day. She’s been coveting them for a long time and I always figured I’d get her one when we stopped hauling the kids around on the Xtracycles. 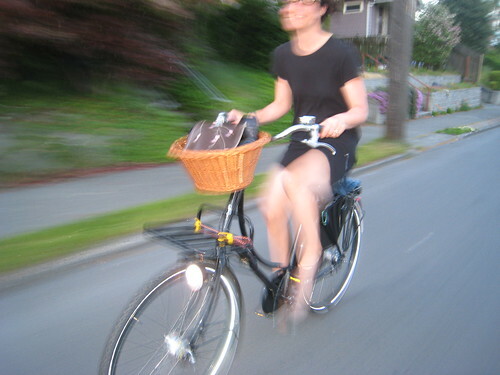 But then the perfect candidate popped up on Craigslist (you do watch Craigslist for bikes every day, don’t you?) and those plans went out the window. 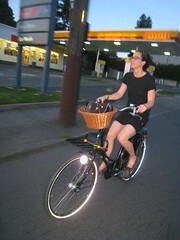 The bike was everything she’d hoped for: Upright position, classic black “Dutch” styling, built-in generator hubs and so on. She totally deserves it—because she’s a dedicated rider and a great mom. Though the price was an absolute bargain for a mint-condition, fully decked-out Azor, I totally went over my mother’s day budget! On the other hand, it was less than most people will spend on gas this summer! As you can imagine, Anne loves her Dutch Bike (apologies to Copenhagen Cycle Chic, but this Oma is from the Netherlands). It sports so many fantastic touches: sleek timeless style, racks front and rear (rear holds a kid, no problem), integrated lights, cushy Brooks saddle and more. I could go on and on, but since Anne’s actually dying to blog about her Oma-ventures I’ll let her fill you in on the total bike goodness. For now I’ll leave you with a bakfiets-load of photos and videos from a recent Wallingford date night (topped off with desert from Molly Moon’s Homemade Ice Cream. Our recommendation: try the salt carmel!). This entry was posted in bike lust, bikes, dates, neighborhoods, oma, seattle and tagged bikes, carfreedates, datenight, night, oma, seattle. Bookmark the permalink. Yes, the local Craigslist bicycle listings are bookmarked on my cell phone so that I can check them every morning while I sip my coffee. It’s how I caught my current daily commuter, a lightly used 12-speed with plenty of life left, for 25 bucks. Even with numerous upgrades I’m still well under the price of a new department store klunker. Love it, Anne! Can’t wait to see you cruising around town. That is one sweet looking momma. Oh yeah, and Anne looks good too. Sorry, I couldn’t resist. When I get home from work I’ll have my wife elbow me in the side for that comment. That’s an awesome Mother’s Day present and looks like a great ride. Such a thoughtful gift. Nice photos. Its always fun to see “my” bikes in other environments. One suggestion if I may be so bold: Front carrier + handlebar basket = redundant and silly. 2. Drill holes as needed, and secure to the frame-mounted carrier with four big, black tie-wraps. 3. Mount dainty basket on old English bike. The rear carrier is actually strong enough for adults though I’m not supposed to tell you that. Side-saddle with a rolling starts is the accepted method. Ik wens je veel fietsplezier! What Henry said; any weight in the basket will affect the steering much moer than even heavy loads on the rack, which is attached to the frame. Roll on! Thanks everyone for the comments. The basket came with the bike but it was on the rear. That won’t do for our occasion kid carrying so we strapped it on the front. I think the heaviest thing she’s had in there is her purse… we’re still working out the perfect front options. I realize the Dutch way would indeed embrace the milk crate. I probably would too, though Anne isn’t ready to go there yet. In reality the rack probably isn’t even needed for her use — She’s got her Xtracycle for heavy hauling; this is her free and easy, skirt-wearing city bike — but the rack is so cool (and came with the bike!) so it’s staying on. Besides who knows when you might need to carry a case of beer, a purse, AND a kid on the back. The Baker basket looks good. Once again and after a second, third and fourth look. This bike is cool!